Our large King-Suite offers a super-king-size bed with stunning views of the scenery and horses. The King-Suite accommodates a single person, couples and also can be used as a family room with an addition of two extra single beds if required. 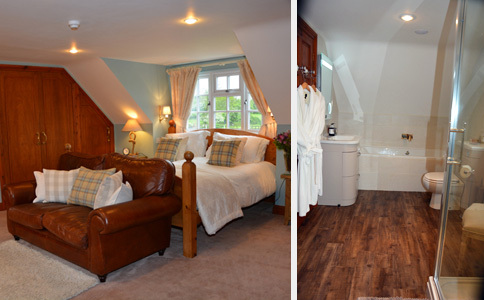 Our en-suite bathroom has a walk-in shower with an addition to a separate, luxury bath. 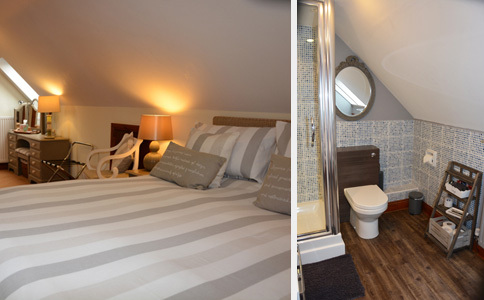 This en-suite provides scenic views of Cleeve Hill through our large windows. We are positive our guests will be provided with a comfortable and relaxing stay in our King-Suite. Please see our gallery for more photos. All the above prices include a full English breakfast. Please note we do special rates for long term business guests starting from £30 per night. Our Queen-Suite offers a large, comfortable king-sized bed and can accommodate a single person, couples and can also be used as a family room with an addition of one extra bed if required. Two large screen televisions’ are provided in this suite, one in the seating area and one wall-mounted at the foot of the bed. We are positive our guests will be provided with a comfortable and relaxing stay in our Queen-Suite. Please see our gallery for more photos.